We’ve officially started our summer program with the girls and today was the first day of our weekly afternoon trip to the beach. With 11 girls plus Isla and 3 or 4 adults, we can’t afford to go to a private beach. …which means we have to find public access to the sea, which is very rare in and around Beirut. 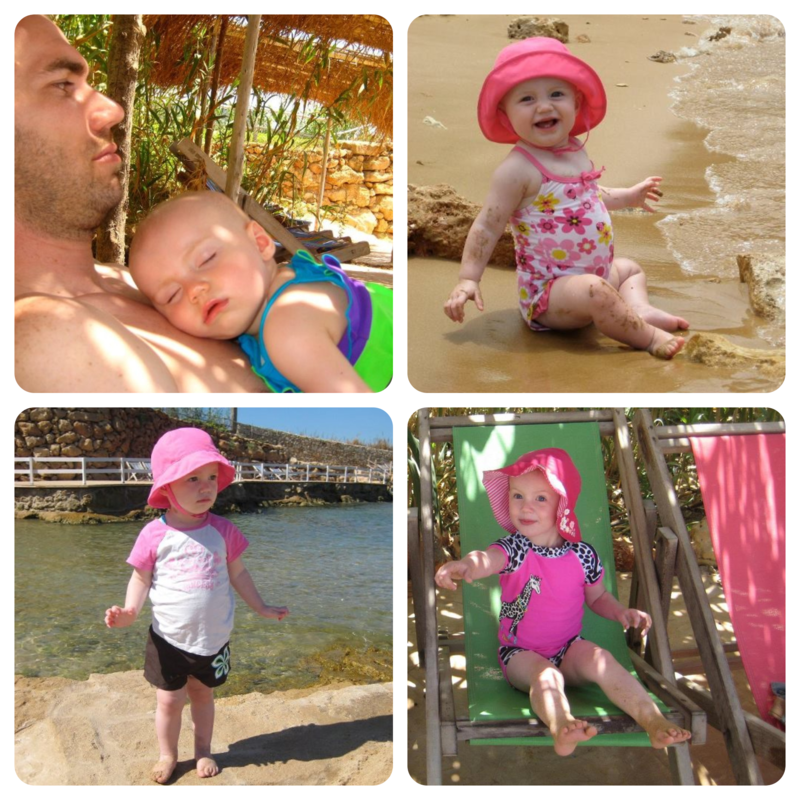 We used to take the girls to Ramlet elBaida. The jellyfish and hypodermic needles almost scared us away, but the cockroaches in the water were the final straw. A few years ago we found a nice little spot just off the Corniche. You had to hike down a rocky hill to get there, but it was perfect for the girls. No sand, but the formation of the rocks formed a little pool that the girls could swim in. It was a little protected from the waves and not very deep – perfect for girls who think they are amazing swimmers but actually have no idea what they are doing. :) We were usually the only ones there in the afternoons. So we headed back to our little spot today… it was insane how crowded it was! There were dozens of families parked on the rocks, and the small swimming area was so full of people you could hardly move at times. Not sure why it has become so popular… maybe no one else can afford the ridiculously priced beach clubs either? Either way, we are on the hunt for a new swimming hole… any tips?? Summer is anything but lazy for us. It’s actually one of the busiest times of the year. But, we did have one week in between school ending (both for the girls and the class Caleb was teaching) and the craziness of summer beginning. That’s not to say papers didn’t need to be graded and prep for the summer program done, but we at least didn’t have anywhere we had to be. So on our first day of “summer,” we made our annual jaunt down to our all-time favorite place in Beirut… Lazy b. It’s no longer Lebanon’s best kept secret – it’s actually quite popular now, which means the prices have gone up (23$ per person now – ridiculous!!!) and they are making all sorts of “improvements” – new pools, new restaurants, etc. I had a coupon from LivingSocial and they actually didn’t make us pay for the kids this time, which was a nice surprise. And it was still super quiet on Monday morning – we had the beach to ourselves until lunchtime! 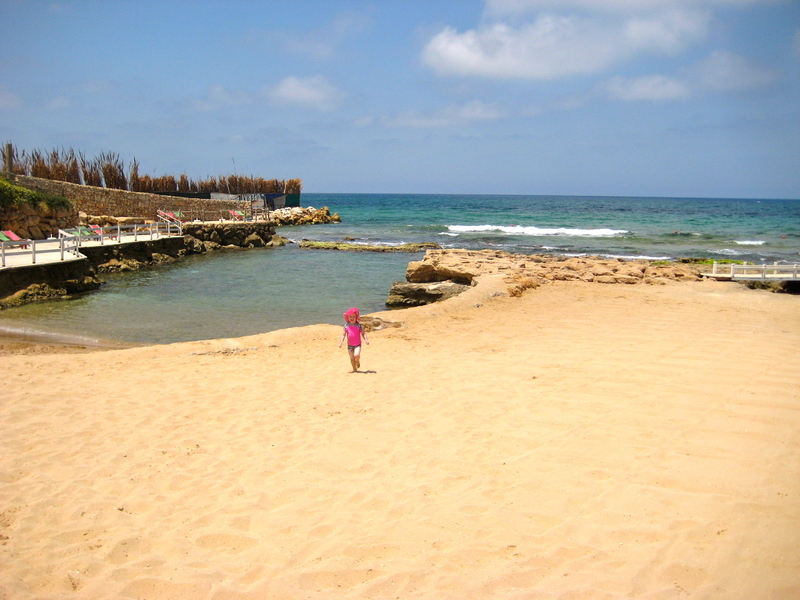 Lazy b is one of the few sandy beaches in Lebanon. And it is one of the only beaches that doesn’t play loud music… although the beach next door had theirs blaring, so it wasn’t as quiet as it has been in years past. They added a new family pool, which is fun, as previously kids weren’t allowed in the pools. Never really mattered to us, as we like to park it in the bamboo shelters next to the sand and enjoy the sand and sea… and the shade for the baby. 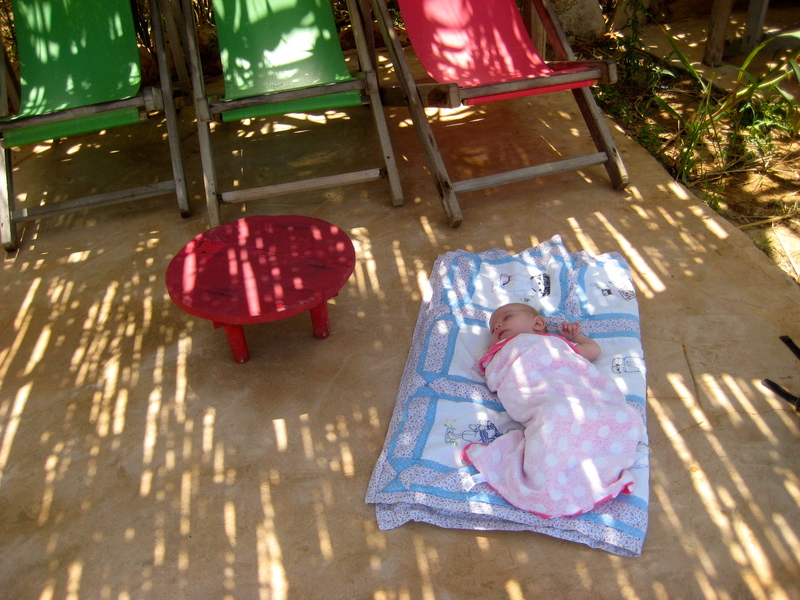 Ruby is a bit too young for the beach, I think, although she did swim in the pool. It definitely changes the way we “do the beach” but it was still so nice to take a little breath of fresh, salty air before we dive into the craziness of summer-time! And a dip in a blow-up pool to wash it all off!